Cardiff by the Sea is a beach community located within the City of Encinitas. Despite being part of Encinitas Cardiff-by-the-Sea has carved out its own distinct identity. 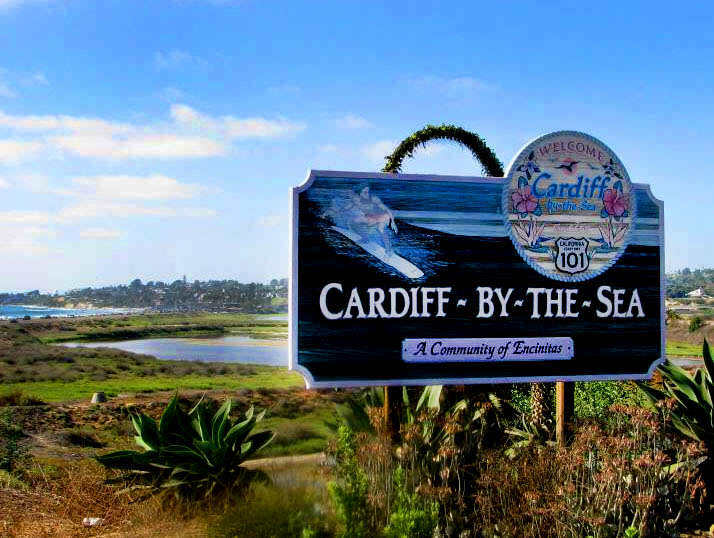 Cardiff-by-the-Sea with a population of just over 10,000 residents even has its own zip code (92007). Cardiff-by-the Sea is known for its beautiful beaches and surfing culture. Cardiff-by-the Sea is also the home of San Elijo State Beach, a popular oceanfront campground. Cardiff Reef is an area popular with surfers that produces magnificent waves for surfers of all experience levels. During low tide Cardiff Reef is exposed allowing locals and tourists alike to enjoy the many tide pools with their abundance of sea life. Cardiff was founded in 1911 when a Boston painter named J. Frank Cullen broke ground to begin developing new homes on a large tract of land in San Elijo. Local legend has it that Frank Cullen wanted to give the community Spanish names due to the close proximity of Mexico but his wife, who was born in Cardiff, England, convinced him to name the community Cardiff after her homeland. In 1914 the area officially became known as Cardiff-by-the-Sea. To this day many of the streets in Cardiff still possess the English names given to them by the Cullens such as “Birmingham,” “Oxford,” “Chesterfield” and “Manchester”. Due to Carlsbad-by-the-Sea’s close proximity to the beach, the magnificent views, award winning schools and desirable location Cardiff-by-the-Sea real estate can be quite competitive.